Dental Clinics directory, showing website links, locations, telephone numbers, and category tags. About Dental Assistants, including a discussion of job responsibilities, working conditions, educational requirements, and employment outlook. About Dental Hygienists, including a discussion of job responsibilities, working conditions, educational requirements, and employment outlook. About Dentists, including a discussion of job responsibilities, working conditions, educational requirements, and employment outlook. Photograph of color-coded dental instruments, with a dentist chair and dental lamp in the background. 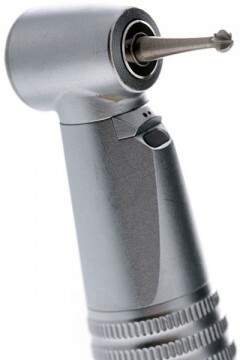 Photograph of a dental handpiece, commonly known as a dentist drill. Photographs of several dental burs, stored on brushed metal trays. The carbide burs and diamond bur shown in the photos are used in dentistry. Read the history of the modern toothbrush and learn about manual and electric toothbrushes. Compare and shop for toothbrushes and dental care products. Photograph of a dental handpiece and a carbide bur, isolated on a white background. Photograph of a 3-way, air and water syringe used by dentists and dental hygienists. Photograph of three periodontal probes used by dentists and dental hygienists.